I definitely believe in teaching your children to be responsible with their own money and not support adult children at all. Unless it’s a true emergency, I don’t think I’ll be handing any money out to my kids once they are on their own. I started paying for everything myself at age 18, even paying for my own wedding, cars and house. Though it was frustrating sometimes not to be able to purchase something, it taught me to value what i did have and appreciate the work I needed to put in to make a purchase. I think it’s more loving to tell your kids “no” and to have them figure out another way to overcome their obstacle other than looking for a parental handout. It teaches responsibility and also that there are consequences to bad decisions. I think the key is to never raid one’s retirement funds or decrease payments into the fund for one’s children. I don’t do that. But I do help out (and sometimes bail out) my children from time to time. Partly it is because they are children who were adopted from the foster care system and they have on-going special needs. Partly, it is to help maintain stability for my grandchildren. It is hard to draw those lines sometimes. I think a lot of people need to learn this lesson. While I might have gone back for funerals you definitely have to know when to say know. I agree, you have to teach your children at an early age that asking for money is not the answer. They need to learn to live within their means. If they don’t have the money for something, then they don’t need it. I’m very lucky that my children have never had to come to us for money. I have seen people suffer a lot because they couldn’t say “No” when they should have. I have learnt a lot from them and trying to say no when saying yes could be a life long pain. Wow, great minds think alike! I actually wrote up a post on how to say no to siblings when they ask for money. Miss T has it scheduled for Prairie Eco Thrifter on June 6. My Mum started me on this one young “You are going to love being a poor student” – and she lied, It Sucked!!!! But it has set me up to realise that she is not my personal piggie bank – that I am independent and have to be so. Time to start saying this to my own little brood I think. How was the dollar given? Was it as a symbol for something? My grandpa used to give me $50 but he did that my whole life. It never changed and never had much meaning although I am sure he loved me. I don’t think it is one or the other always- but our kids know that retirement is top priority. They are more important than a grand tour of Europe though, and that is the way we planned it. We saved for our retirement AND the gifts. House is paid dor and retirement looks pretty good. We get far more joy out of spending on them than we ever did traveling. There are many ways to love your children. Supporting them financially as adults can be one of the most harmful. I’m sure my parents would have bailed me out if I ever needed it, but I am very proud that I never had to hit them up. Like Jacob, I paid for my own wedding, house, cars and college tuition. So did all of my brothers and sisters and we have all done pretty well. Even though I saved up college funds for my two kids, they already know I expect them to make it on their own. I believe that each generation to should pave their own way and make their own mark on the world. Sometimes parents keel over backwards for their kids – but that can leave them missing out on some of the most important character building experiences in their lives – like struggling to pay tuition, or learning to be frugal to pay off student loans, etc. Saying no to the next generation can make them stronger better individuals. Particularly if your adult children are able to support themselves already, you’ll be doing them a favour in the long run by saying no more often, it will make them look for ways to earn the money themselves – everybody will benefit from this. Excellent post and one that I can really relate to being in my 50s with three kids ranging in age from 19-23. So far we have one out of college and on her own. She is largely self-supporting, though we do help with a couple of expenses. Our other two are in college, but both seem to have a good sense for managing their money. 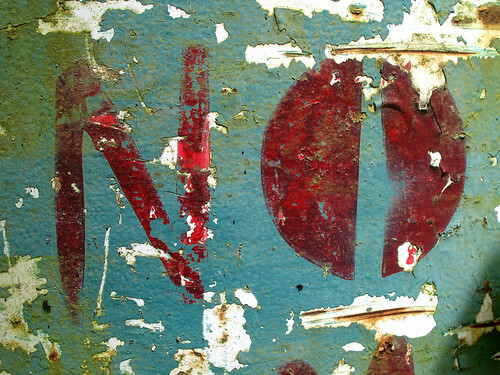 We are pretty good at saying no, but there is probably some room for improvement. Helping your children is a very personal issue. If the need is for health care I would not retire in comfort if I had said “no” to the child’s medical needs. However, it does seem that children are having a difficult time learning to save money before making the purchase. Anyone know what’s happened to this blogger? The blog hasn’t been updated in quite a while. I know this blogger, but I haven’t seen her in a while. She is probably burned-out or has other more important personal matters to attend to. Blogging takes a lot of work and pays very little. She may start writing again in the future.